Skin lightening products ̶ also known as bleaching creams, whiteners, skin brighteners, or fading creams ̶ work by reducing a pigment called melanin in the skin. Most people who use lighteners do so to treat skin problems such as freckles, age spots, acne scars, or discoloration related to hormones. It is also a technique used to lighten naturally dark skin. Multi-national cosmetics brands have found a lucrative market: Global spending on skin lightening is projected to triple to US $31.2 billion by 2024, according to a report released in June 2017 by the research firm Global Industry Analysts. In Nigeria, 77% of the country’s women use skin-lightening agents, compared with 59% in Togo and 27% in Senegal. But the largest and fastest-growing markets are in the Asia-Pacific region, according to mosaicscience.com. Skin lightening and whitening agents in cosmetics are often used to produce a more even skin tone, usually to the face and neck, but sometimes they can be used more extensively over larger areas of skin. These products may be marketed to consumers as either a cosmetic to improve appearance, or as a therapy to treat skin conditions (i.e., a drug). The distinction between a cosmetic and a drug is important from regulatory and safety perspectives because, among other things, a product marketed as a cosmetic should not contain active pharmaceutical ingredients (APIs). Otherwise, they should be classified as a drug according to European Commission’s No. 1223/2009 and the U.S. FDA’s regulations on Cosmetics. Some creams sold over-the-counter or online may contain potentially harmful active ingredients that can lead to health concerns if not prescribed under a physician’s care. Cosmetics and personal care (CPC) companies, as well as regulators, regularly use chromatography to test skin care product ingredients, from raw material testing, formulation, and quality control to safety and regulatory testing, identification of counterfeit products, and verification of label claims. In a recent application note, our science team investigated several skin lightening products – marketed by online retailers as cosmetics – that contained prohibited active pharmaceutical ingredients such as hydroquinone, corticosteroids, and tretinoin. Samples were extracted and analyzed on Waters ACQUITY Arc UHPLC System equipped with a 2998 Photodiode Array (PDA) Detector and the ACQUITY QDa Mass Detector. The addition of mass detection as a complementary analytical detection technique to PDA enhances confidence in compound detection and identification. The ACQUITY QDa is designed for use by chromatographers. Empower 3 Chromatography Data Software (CDS) was used for data acquisition and processing and to ensure data integrity. The CORTECS T3 Column stationary phase used in the separation contained a 2.7-μm particle designed to give maximum efficiency and exceptional retention for both polar and non-polar analytes. Several of the cosmetic samples tested positive for prohibited skin lightening agents. The packaging labels were often misleading, and in some cases, the presence of the active ingredient was not declared on the label, or the enclosed product information, increasing the likelihood of improper long-term use and adverse side effects to consumers – as cosmetics are usually used over long periods of time with no medical supervision. Summary of the quantitation results for selected skin lightening compounds in the samples and the typical usage concentrations. MJ-1 and MJ-2 were purchased online. 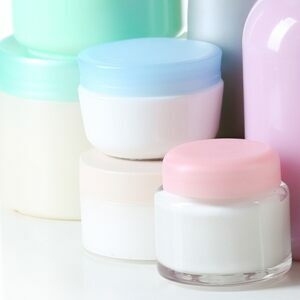 Corticosteroids and tretinoin are prohibited for use in cosmetics in the EU and the U.S. Hydroquinone was detected at levels violating both EU and U.S. regulations. This UHPLC method could be used in the routine analysis of cosmetics to screen for skin lightening agents to ensure that they meet regulatory and safety standards.